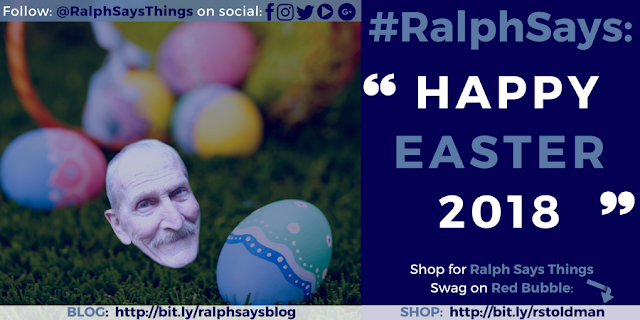 We at Ralph Says Things want to wish you a very Happy Easter Holidays whatever you're up to. Easter is not something we Newcombs celebrate anymore, but every year on the day, Ralph Says "Happy Bunny Day" to everyone he speaks to. This year, 2018 will be no different. Have many fond memories of super-fun Easter Egg Hunts in all four corners of Northern California. It truly was a much anticipated and magical holiday...with time spent coloring the eggs, hunting for the eggs with cute, little baskets and eating chocolate bunnies. In America, in the 1970s at least, we didn't have chocolate eggs. It was always bunnies and eating it almost always started at the top of the bunny - rendering the poor guy deaf. It's funny how different countries have different traditions,...For example, in the UK, it's Chocolate Eggs and some fun rolling eggs down hills. Do you have any Easter traditions - old or new? 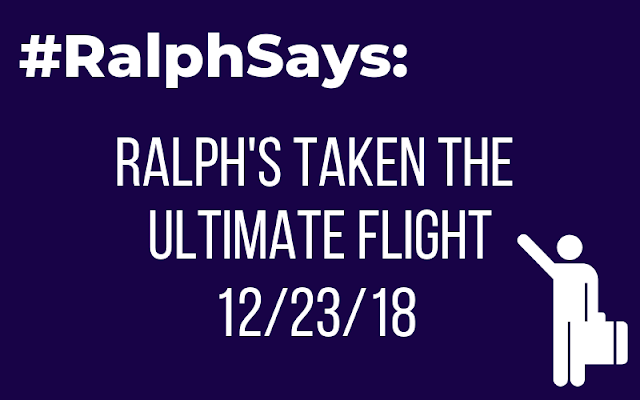 Ralph is officially a GREAT Grandfather. Daughter number 1, Wendy has officially become a grandmother herself, as her eldest daughter Jamie gave birth this week to a wee boy called AJ. Mother and baby are doing well from what we hear. Exciting times ahead. Potentially a room with four generations in it this Christmas time. (Jamie and AJ reside in Southern California you see). For those who have been following along, Wendy recently had her final surgery from Cancer and is on the mend getting stronger by the day. Thanks for all your messages, comments well wishes and #WendyVibes on social. 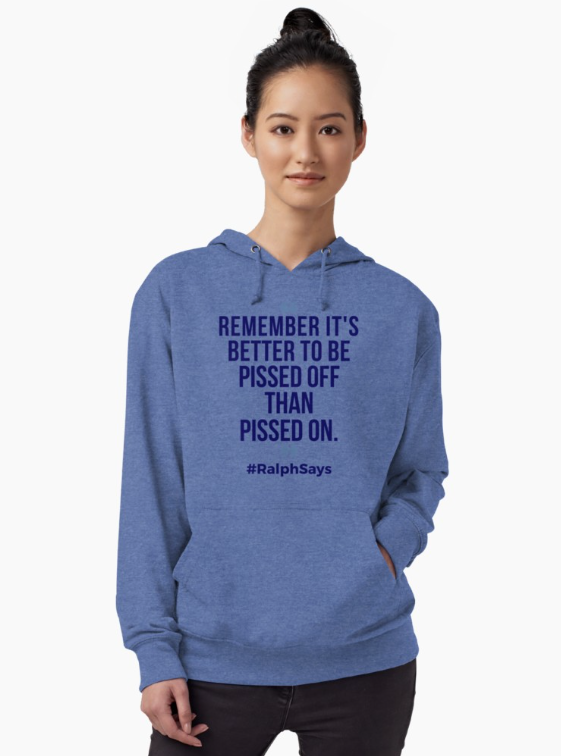 Most days Ralph, comes up with t-shirt ideas, which he then passes on for either approval or veto.... For every four or five suggestions - comes one gem, usually. "Today's mountain is yesterday's molehill, tomorrow". Bit wordy, I know, but you get the gist, and I kind of like it. He loves it! This weekend on the Ralph Says Things Facebook page - we shared a post from Friday memes that went down a storm...Organic reach - nearly 1000 (not bad for a page with less than 150 fans). 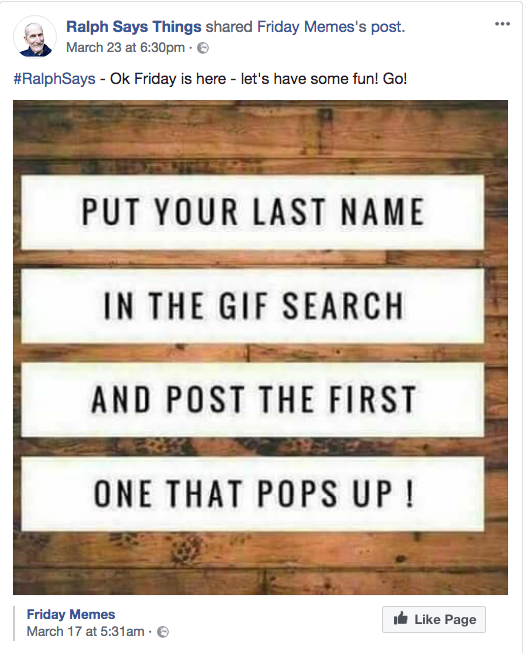 The post simply asked people to type in their last night to the GIF generator and use the first one. It was a lot of fun. That's enough for this post. Please do follow Ralph Says Things on Twitter or Instagram or that aforementioned RST Facebook page. 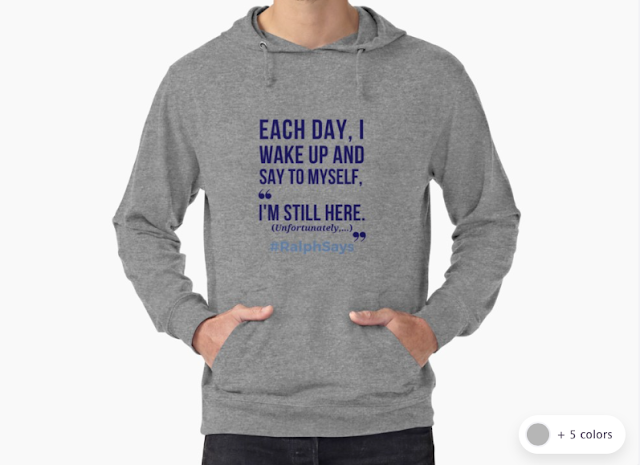 As always, you can shop for Ralph Says Things merch over on his Red Bubble shop.